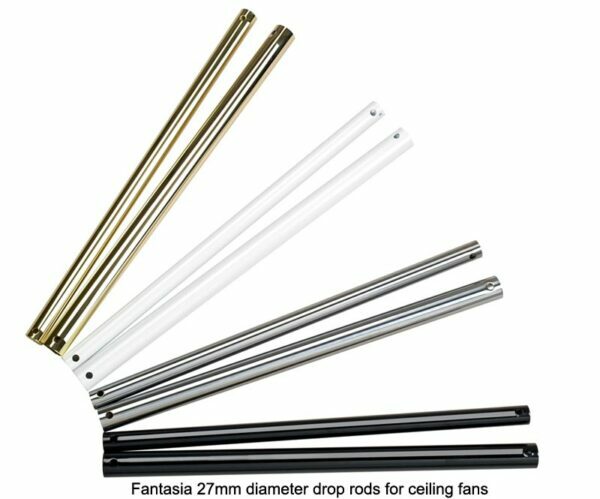 Fantasia 22mm diameter ceiling fan drop rod 12″ long in brushed nickel finish for Capri, Gemini, Islander, Mayfair, Medina, Palm, Riviera, Spinnaker, Wicker, Atlanta, Scorpion, Rio, Rimini and Kroma fans. Please note: some fans require a conversion kit to enable the use of a drop rod and they vary in diameter according to model. Please double check that your model is listed above prior to purchase or contact us so that we may assist you.